I was compensated for and received product from SmartPond last year. I have not received any more compensation from them, but I love talking about my pond and fountain. I’ve been slowly getting a few flowers planted in the flower bed I made last year around the fountain. Some of the ones we planted last year came back and bloomed already this spring. I’ve had gardening fever for quite a while, but it seemed like it rained every day from the end of March until the first of June. The soil was definitely too soggy to dig. 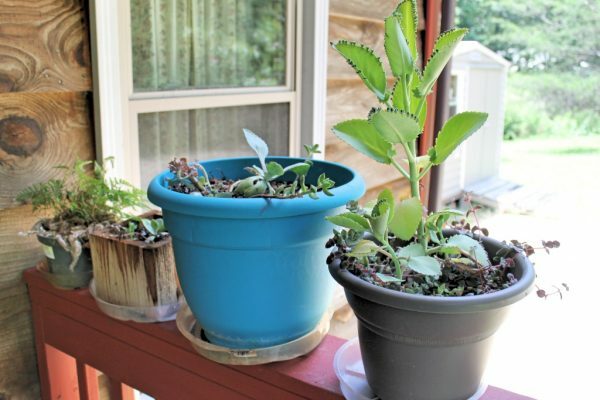 So, while we waited for the rain to stop and the ground to dry out, Fabgrandpa repotted his succulents that spent the winter on the enclosed back porch. Fabgrandpa’s succulents were repotted and line the porch rails. By the time we went to Home Depot to buy some flowers and some bags of soil, the annuals had already been picked over and looked scraggly. I did find one small pot of petunias and two larger pots of Impatiens which were the only annual flowers I bought. Basil, Curled Parsley, Oregano, a tomato plant and two sweet potato vines rounded out the rest of the annuals. 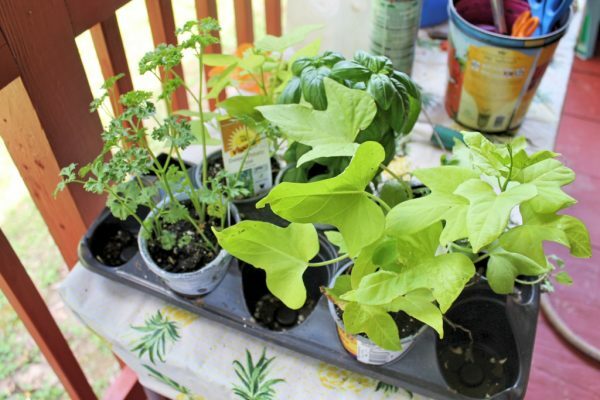 A few herbs and a couple of sweet potato vines. When I said I was s-l-o-w-l-y getting the plants in the ground, I really do mean slowly. I have managed to get one or two things planted a day. I am finally, after five years, getting in the mind set that I can not do it all in one day like I used to. Knowing that and accepting that about myself has made getting the garden in the ground this year much more pleasant for me. I have a small folding chair that I can sit on to work in the raised bed by the pond without hurting myself. So, here are some pictures of some of the things I planted last week. 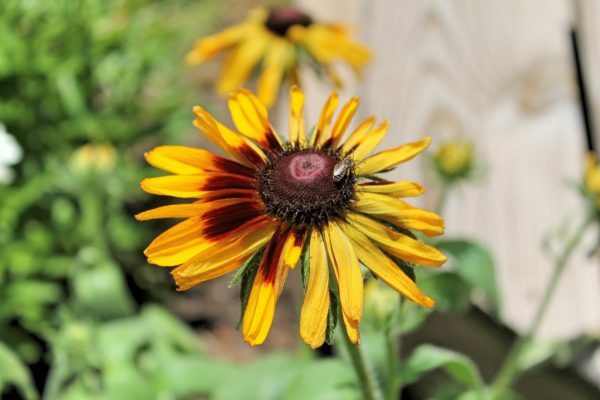 A beautiful Black Eyed Susan. 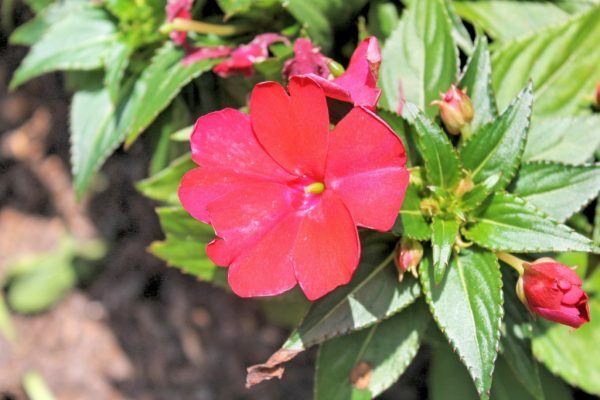 Impatiens to attract butterflies and hummingbirds. 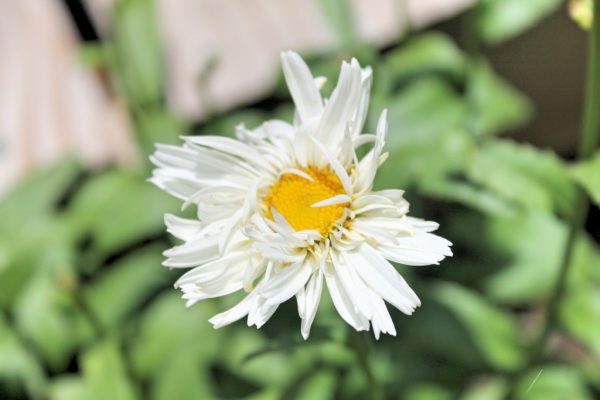 This Shasta Daisy was planted last year and has really bloomed its heart out this spring. 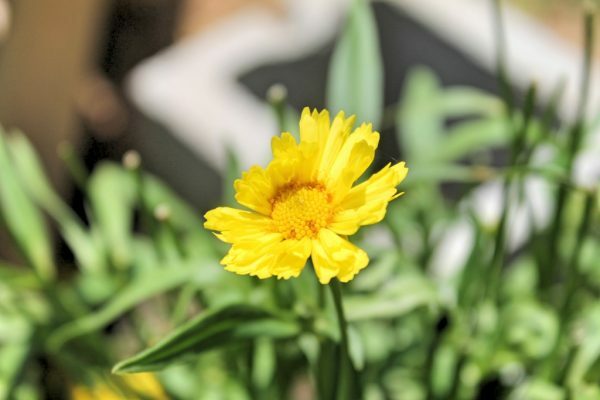 I love Coreopsis! Once it gets established, it comes back every year and blooms all summer. We will add another side to the garden later this year. 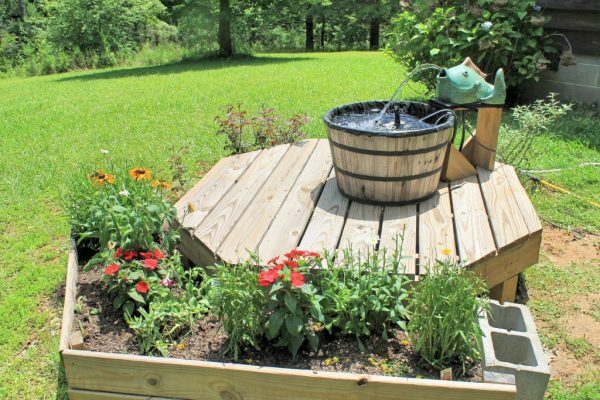 Eventually, the flower bed will circle the entire pond. Eventually, the flower bed will circle the entire pond. There are two Knock Out Roses on the other side of the fountain, and two butterfly bushes in the back. I’m going to plant the Sweet Potato Vines in a large pot, and place it so that the vines will cover the support that the fish sits on, and hide the wires. I might be slow, but I do have a plan, and like the tortoise, I WILL win this race. Here is a short video of the fountain in operation. Don’t you just love it?